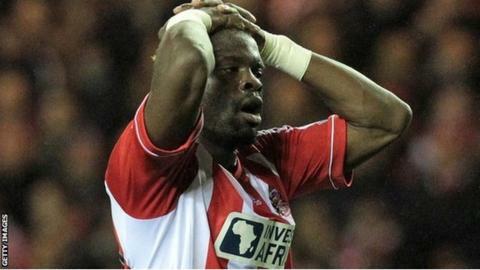 Sunderland have released former France international striker Louis Saha on a free transfer. The 34-year-old, who joined the club from Tottenham in August, did not start a game for the Black Cats in the Premier League. Louis Saha has played for six English clubs during his career - Newcastle, Fulham, Manchester United, Everton, Tottenham and Sunderland - and scored a total of 147 goals in 421 appearances. "We wish Louis all the very best for the future and thank him for his contribution," said Sunderland chief executive Margaret Byrne. Saha has previously been linked with a move to South African club football. He made a total of 14 appearances in league and cup since joining the club last summer, without scoring. The veteran netted 147 times in 421 games in English football, winning the Champions League once and Premier League twice with Manchester United. He had considered retirement in the summer after being released by Spurs following a short-term spell at White Hart Lane.